Everything was diluted, so it wouldn't have lumps on the fabric. After drying the dress was washed on the gentle cycle. Diane was a little curious how the plaster parts would turn out, and thinking at first that no one would ever wear it, (After all it was for a contest!) she sanded it, Yes! she sanded the dress with sand paper! If you have ever used Lusterstone on a wall and sanded it, well that is what happened to the dress! 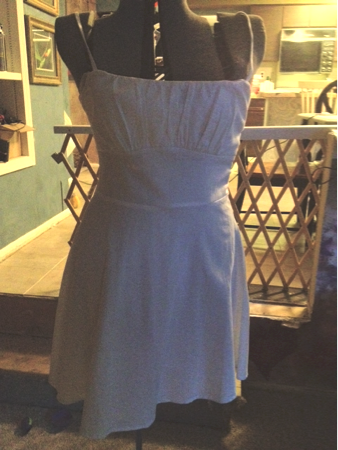 The sanding made the dress feel like glass, smooth, pretty, yet it still has a couple of interest spots. See what playing does? Diane put second coat on because it faded from sanding. 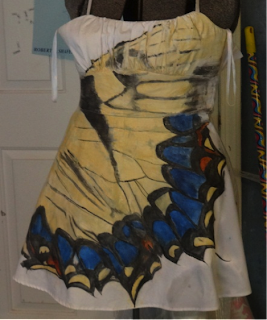 She used a variation of the materials listed and the end result is a fabulous dress dying to be taken out on the town! It started with a plain white dress. Diane wearing her beautiful new dress. Diane Corso comes from a strong business background and was a computer designer for 13 years. However her love for art was hidden inside herself for many years beginning with her childhood. Her greatest gift is color. In her field she excels in good vision, a colorist, and excellent composition being able to reproduce anything shown to her. 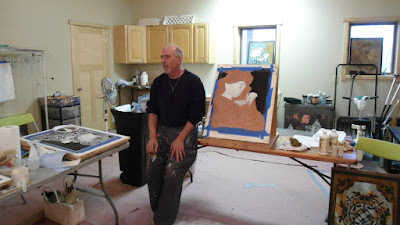 An accomplished muralist and decorative painter who recently finished 68 huge marbleized columns for Merion Industries. Diane has been published in numerous trade magazines, televised on Pennsylvania morning shows and instructed art at Temple University. Her fondest contribution is teaching art to children and giving strength to their beliefs, thus possibly inspiring a Tiepolo of the future some day.